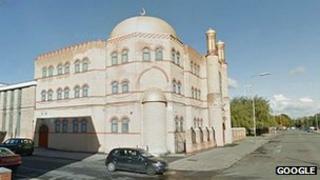 Two controlled explosions have been carried out on a suitcase found inside a mosque in Liverpool. Bomb disposal experts exploded the "suspect package" near the Al Rahma Mosque on Mulgrave Street in Toxteth at about 23:30 BST on Sunday. Homes around the mosque were evacuated while the explosions were carried out. A Merseyside Police spokesman said it was a precautionary measure and no explosive materials were recovered from the scene. He said the suitcase had been left inside the mosque, but was carried outside by someone before police were called. He added that investigations in to what the package was - and who had left it - were "ongoing".